To contact Zia, send an email to zia (at) tassellations (dot) com. If you would like to book her for an event, she will charge the standard local rate as seen on the Belly Dance Rates by Region webpage. For current performance information, please visit Zia's Facebook page. Zia took belly dance briefly in the early 1990s, picked it up again in 2007, and has been studying it steadily ever since. 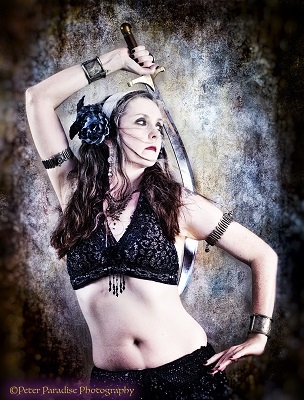 She has taken regular classes with The Goddess Dancing, Phoenix Avathar, Melina of the Daughters of Rhea, Aepril Schaile, Nadira Jamal, Najmat, OmBellyCo, and Kaylin, as well as with various workshop instructors. Zia is a regular Friday soloist at The Athenian Corner Restaurant in Lowell, where she dances in the traditional American Cabaret style. She also performs American Tribal Style with Tassellations, and solos in both Tribal Fusion and Raqs Geeky. She has performed in settings as varied as the Arisia science fiction convention, the Honk! parade, the Watch City Steampunk Festival, the Waltham Riverfest, and stART on the Street. And because being a wage slave and a bellydancer isn't enough, Zia is also a science fiction writer and radio theater performer. All photos above this line by Peter Paradise Michaels. The photos below are by Moonbindi Photography.